Due to the wooden board, bamboo hidden trouble in security in the building process, prevent slippery effect is poor, less ratio of steel board, therefore has gradually can not adapt to the construction of the domestic industry, steel acaffolding planks is the preferred alternative products. Technical level rising in the building industry at the same time, China's steel Scaffold Boards production enterprise must know the market changes, latest steel plank industry development present situation and trend of development suited to the market and products of different customers, to seize market, rely on their own advantages to innovation actively, continuous efforts, will spur domestic steel Scaffold Boards industry better and faster development. 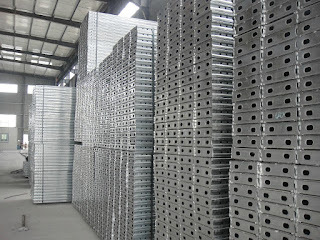 What advantages Galvanized steel scaffolding have ? Before the construction site of the most common is the bamboo board, but as a construction site accident happened time and again, bamboo board is gradually replaced by galvanized scaffolding, now has seldom see the construction site of the large bamboo Scaffold Boards. Steel scaffolding don't clean up garbage shelf, bamboo board regularly to clean up garbage shelf, steel scaffolding planks can be repeated use, pull to the site from other provinces. Galvanized steel scaffolding for the life safety of the construction workers to increase a layer of security, let the possibility that they compromised ten percent less.